However, I do love the smell of cinnamon, nutmeg, cloves, basically everything that goes in apple cider. 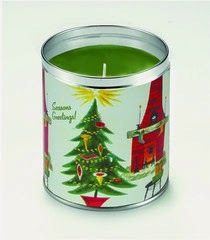 This little project will allow you to make all of those smells come together in about a dozen little ornaments! 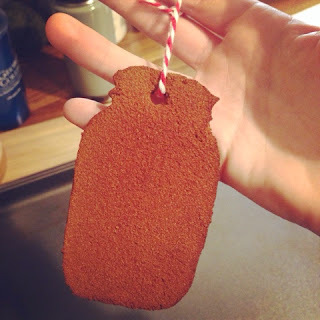 Here's the how-to to make your own Cinnamon Apple Ornaments! * I'd suggest going to Costco and getting the cinnamon there. $2.59 for a huge container and $6 for 3 huge containers of applesauce. Preheat oven to 200 degrees F. Line a sheet pan with parchment paper. In the bowl of a stand mixer fitted with the attachment with larger holes (not the whisk) combine the applesauce and cinnamon. It may take a few minutes for the mixture to come together. You want the dough to be able to form a ball without being too sticky. Add additional applesauce or cinnamon if needed. You can mix the dough by hand, it may just take longer. Sprinkle a clean surface with cinnamon (like you would with flour while rolling out pie dough-I'd recommend a wooden cutting board). Place the dough on the surface and sprinkle with more cinnamon. Use a rolling pin to roll the dough to 1/4 inch thick, sprinkling with more cinnamon to keep from sticking. If it starts to crack around the edges, just rub with a little more applesauce to make it smoother. 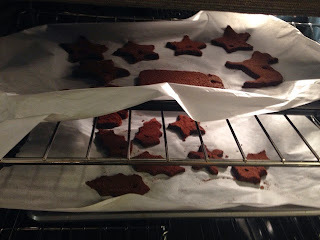 Cut the dough into shapes with cookie cutters and place on the prepared sheet pan so that they aren't touching. Use the plastic cookie cutters with rubber tops on them if working with kids-metal ones have a tendency to hurt little fingers. Use a wooden skewer to poke a hole into each ornament so you can hang with a string or ribbon. I used a strong plastic straw to make my holes. Once again, if the edges of the hole start to crack, rub with a little applesauce to smooth. Bake in the preheated oven for about 2 hours or until rock hard. Loop a decorative string through the ornament and hang on your tree. I found really pretty holiday string on a wooden spool from Target. Note: Ornaments may also be dried at room temperature over several days. Ornaments are not extremely fragile, but they can break. Handle with care. Do not eat!!! But DO enjoy the scent!